Clearly, we at Monderno love kydex.Â Lots and lots of kydex.Â There is a common saying in the industry that â€œkydex is kydexâ€.Â There is a lot of truth in that.Â There are probably 120+ companies making kydex holsters out there, in varying degrees of quality.Â Most, you’ve probably never heard of.Â We were recently contacted by a newer outfit named Forest City Tactical, out of Illinois to review some of their kit.Â FCT started mid-2012 out of a need for a rig and mag carrier for the owner running 3-gun.Â Being a carpenter by trade, after looking around, he realized he could make his own rigs.Â After the usual kydex trial and error, he came up with a setup he was happy with.Â When using it in competition, he was asked by some buddies at events to make rigs for them and FCT was born.Â Based on what I have seen from the samples sent, I can see him doing more kydex and less woodwork in the near future. 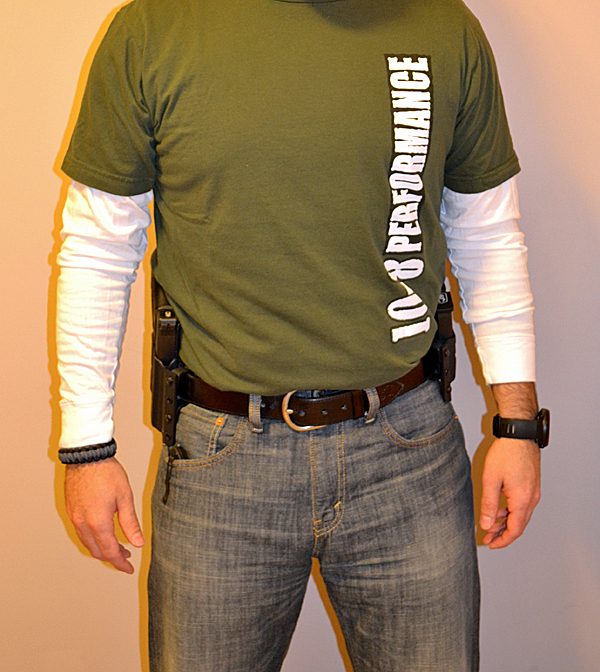 For this review, I had FCT send an OWB setup for my Glock 19, and a double mag carrier, both OWB.Â Holsters can be made with OWB, IWB, or sent with loops for both.Â They are also available in a straight drop or 10 degree cant and in 13 different colors.Â Another option is high or low sweat guard.Â My rig was black, canted and high sweat guard.Â Forest City Tactical uses .08â€ kydex for the front and back of the holster and .125â€ loops, available in 1.50â€, 1.75â€, and 2.0â€ belt widths. 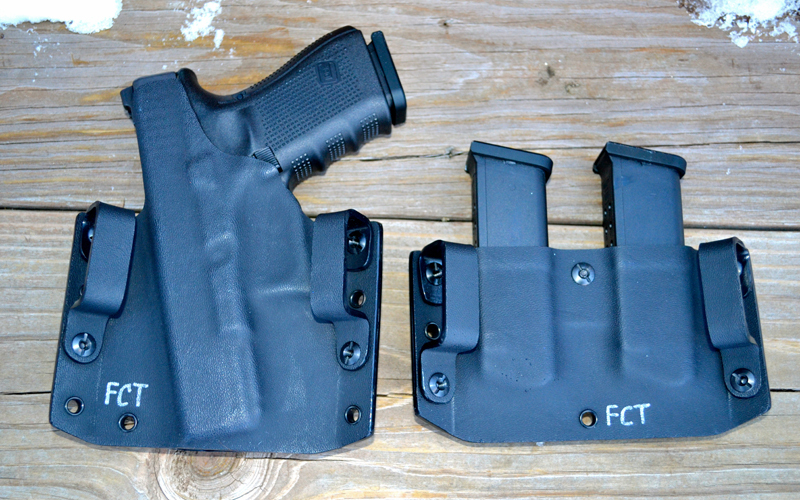 FCT hits the sweet spot in regards to retention.Â Not too tight and very smooth on the draw.Â Â EDC retention is so subjective, but this holster was just right out of the box and did not require any adjustment. 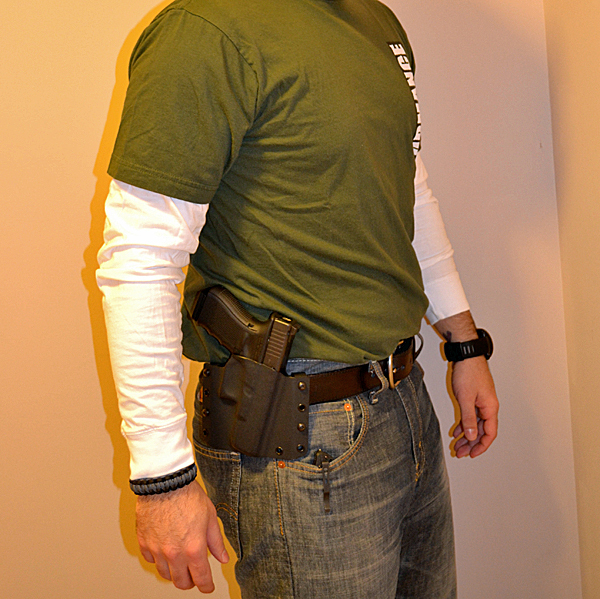 Â Same with the mag carrier. Some companies have a definitive click when the gun seats in the holster.Â This one does not, but it is nice and snug when fully seated.Â Wearing the holster and mag carrier OWB for daily carry (my preference in winter here in Ohio) was no problem at all.Â The holster pulls the pistol nicely to the body and was extremely comfortable for all-day wear. Â It disappears under just a sweatshirt and even more so under a jacket. My Forest City Tactical holster is well finished with crisp bends and smooth edges.Â The top edge isn’t quite as smooth and rounded as the sides and bottom, but as someone that used to build holsters for a living, thatâ€™s probably me being overly picky.Â Â All rivets are sturdy and all evenly pressed.Â Â The molding definition is also very good.Â Â That leads us to the question of value.Â Considering standard holsters start at $55, Iâ€™d say you get a lot of bang for your buck with FCT.Â Â These prices are on par, or lower than most kydex makers out there.Â Add that to a 1-3 day lead-time and that makes Forest City Tactical an excellent choice. Being a new kid on the kydex block, Iâ€™d say Forest City Tactical is off to a very good start.Â Making quality gear at a very affordable price, with a stellar lead-time is a good way to make a name for yourself in the industry quickly.Â If you are looking for a new rig, give them a try, you wonâ€™t be disappointed. That just LOOKS cool ha ha! Awesome review and pics – can’t wait to check these out!